Sports Chosun held their 33rd 청룡영화상 (Blue Dragon Film Awards) tonight in Seoul, South Korea. The event was hosted by 유준상 (Yu Jun-Sang) and 김혜수 (Kim Hye-Soo). The awards were spread around rather evenly. 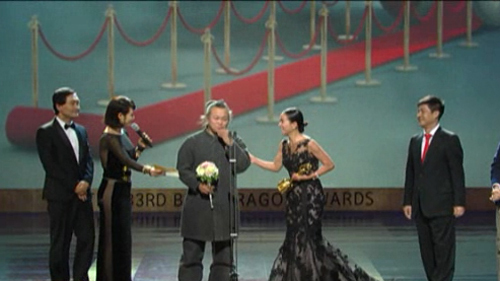 The top prize of Best Film went to 피에타 (Pieta) by 김기덕 (Kim Ki-Duk). It was also the Golden Lion winner this year at Venice. However, it was the film's only Blue Dragon award. 범죄와의 전쟁 : 나쁜놈들 전성시대 (Nameless Gangster) by 윤종빈 (Yun Jong-Bin) won three awards. Yun won Best Screenplay while 최민식 (Choi Min-Sik) won Best Actor. The film's third trophy was for Best Music. 범죄와의 전쟁 : 나쁜놈들 전성시대 (Nameless Gangster) had led with 11 nominations along with 광해:왕이 된 남자 (Masquerade) by 추창민 (Choo Chang-Min), which only claimed one prize for Art Direction. 은교 (Eungyo) also won three awards. 김고은 (Kim Ko-Eun) won Best New Actress to go with the film's wins for Cinematography and for Lighting. Best Director went to 정지영 (Chung Ji-Young) for 부러진 화살 (Unbowed). 내 아내의 모든 것 (All About My Wife) scooped two acting awards. 임수정 (Lim Soo-Jung) won Best Actress while 류승룡 (Ryoo Seung-Ryong) won Best Supporting Actor. 도둑들 (The Thieves) also picked up two awards. It won the Audience Choice Award as well as the Technical Award for its martial arts choreography.